Based upon designs popular during the famed Norman conquest of England led by William the Conqueror, this 11th Century Norman Sword is a functional stage weapon that is perfect for your reenactment or stage combat from this era. 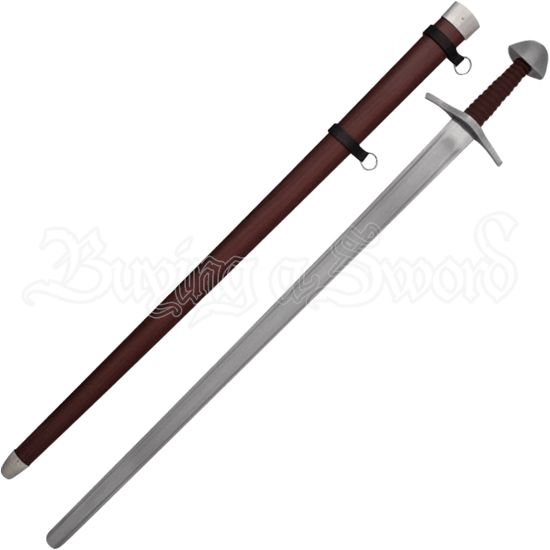 Crafted from high carbon steel, this sword features a deep fuller that greatly enhances the lightness of the blade. The guard features two wide steel quillons, while the hilt is grooved and wrapped in leather for a sturdy grip. A steel tea cosy pommel caps off this sword, while a wooden scabbard with steel and leather mountings comes included with it. The style of the 11th Century Norman Sword comes from one of the most highly studied periods of Anglo Saxon culture, making it a great weapon for enthusiasts of medieval culture or reenactors of this time period.